If kindness was a color, a shape, a size, a design, what would it be? If kindness came in a certain fashion, style, and elegance, what would we see? If kindness spoke with a certain sound, texture, or vibe, how could we dream? It’s one thing to speak words of kindness. It’s another to feel their warmth, once they are spoken. Part of the fascinations of kindness pertains to the ability to enrich the Spirits of others around us. Whether it be actions of kindness, or the words that they produce. There is a deeper level of kindness. One that allows us to envision the spaces and places, where she/he, can be found. So, during one session of the English Conversation Café, at the Maadi Public Library, attendees (and facilitator) participated in the conversation of exploring kindness. What a delightful and fruitful conversation it was. Students and professionals all joined in to design and witness discussions on kindness. 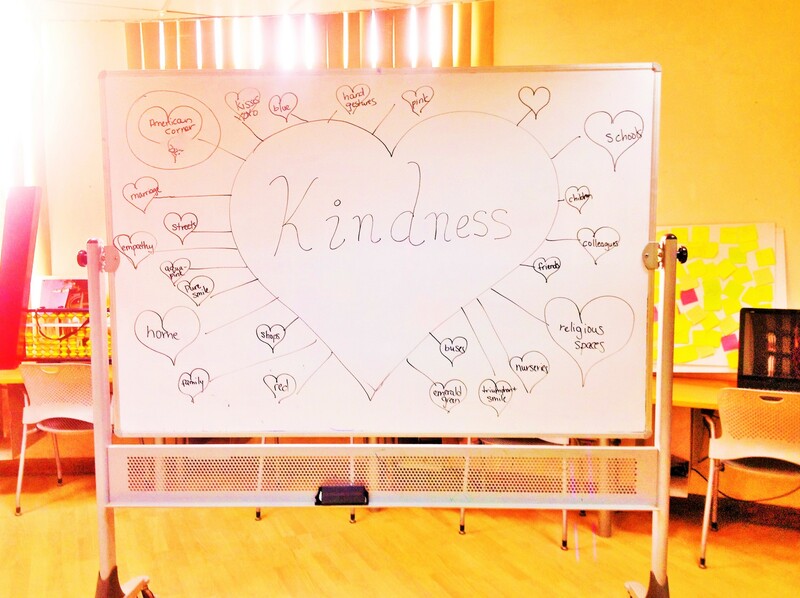 Beginning with a trusty heart map (*wink wink*), a brainstorming of kindness, took place. Where can kindness be found? Are there particular places, where we expect kindness to be? Our social circles? Our families? Our work spaces? It was all part of the exploration for the grappling of kindness. The different colors, expressions, facial features, that come with. . .being kind. Moving on, if you please. After the delightful heart map, had been complete, it came as no surprise, that the room (and conversation) became a little more. . .warm. You could truly experience. . .kindness. More than just a. . .word. Kindness came to life. So, during the English Conversation Café topic on kindness, the interaction among attendees took on a more humane nature. It was not simply about coming to an English conversation session to practice one’s use of the English language. Or, just trying to speak for a few minutes, just to know the “right thing” to say or memorize. Through the topic of kindness, one begins to feel the energies and rhythmic flow, which is associated in mastering any language, at hand. It feels good to speak and to move through a language. Even if the grammar, pronunciation, or structure is not up to par. Part of this pertains to the topic at hand; the sensory, which is connected to the topic. A topic that is exciting, rejuvenating, and nourishes the Soul. It’s why the selection of topics, such as kindness and others, are especially important. And especially, at a space as the American Corner at the Maadi Public Library. Speaking on kindness allowed participants to harness into how kindness shows up in their own families, social circles, workplaces, student spaces, in Cairo, and in Egypt. . .as a whole. It is part of the dynamic of going through that energy, and the words connected to it. And, through our moving through kindness, the very word, itself, is brought to life. Moving through kindness means that we can feel the word. Our imagination creeps up, upon us, and we are able to see the different images of kindness, come to life. It is so fascinating, that our childlike nature comes out to play. So, on the day when the American Corner at the Maadi Public Library, engaged with the conversation of kindness, it came to be that participants (and facilitators) brought in their own, personal touch. They saw kindness within themselves, and within each other. In fact, kindness even decorating the spacing area. The fabulous ladies of the American Corner, happened to have even been dressed in the color of compassion and kindness. And, their attire illuminated the spacing. Even their style and shape brought out the personification and style of kindness. What more can one gain from that? The English Conversation Café, for that day, would come to an end. Kindness had taken it’s course. Nevertheless, it was one of those days, where the onward journey of grappling with the English language (with other like-minded individuals) took on a kinder tone, for all to see. It is part of that essence, where a language (any language) performs what it is supposed to do. Breathing life, birthing aesthetics, and enlightening mentalities. Throughkindness, the balance of languages takes place. One becomes forced to embrace the myriad of languages, created by humanity’s diversity. And so, it becomes part of the conversation for language (and it’s instruction) to take on a kinder tone.